The MS-1706 Wall chaser has FR electronic control with tachogenerator constant speed control, soft start, overload protection and temperature monitoring. It has a patented swivel-mounted motor (EP1693169) which allows for push and pull cutting. It has optimal dust extraction and maximum safety due to enclosed guard and a tool-free blade changing and slit width adjustment. The MS1706 also has a rotating adaptor for dust extractor, tool-free cutting depth adjustment, plunge cut stop. 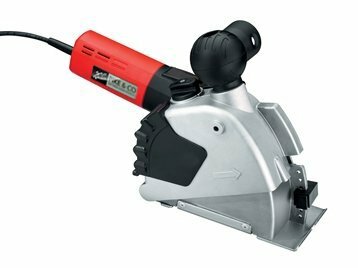 It chases two parallel slots up to 35 mm deep and 30 mm wide and the slot breaker for easy removal of the remaining material without a hammer.